Dan had his first one-person exhibition in 1977 in the Ulster Arts Club Gallery, and went on to become heavily involved in the club. Not only attending classes, but later helping to organise exhibitions and becoming Chairman from 1993 to 1995. In 1999, Dan was able to leave his job in a bank to become a professional artist. Since then he has exhibited extensively, and travels in Spain and Italy have further inspired his work. He also develops his ideas through blogging and social media. The Enigma of Reality is included in the collection of the Arts Council of Northern Ireland. The painting addresses the intangible nature of reality. 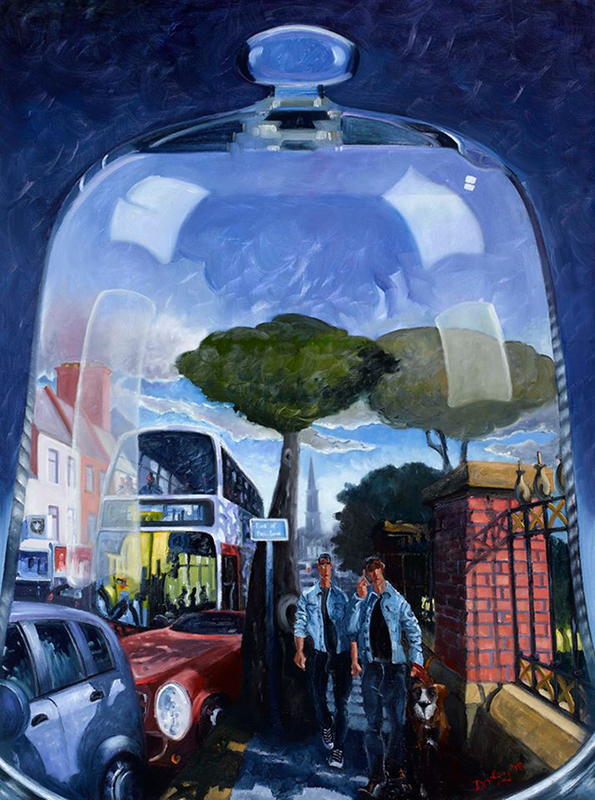 The painting shows the busy Antrim Road in Belfast, at the Waterworks Park. It captures a moment in everyday life, and places it within a glass bell jar. Suddenly reality becomes something very different and a lot less tangible. Is the moment real? The painting seeks to stimulate ideas in the mind of viewer and allow him or her to come to their own conclusions.